Crafts and Creative Media in Therapy 4 Edition Engagement in crafts and other creative activities is making a comeback as an established method in the occupational therapy rehabilitation process. 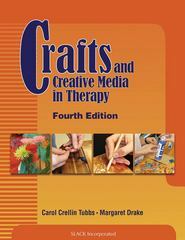 With the profession promoting a return to purposeful activity and "occupation" as key components of treatment, the Fourth Edition of Crafts and Creative Media in Therapy will continue to be a leading resource.For more than 15 years, Carol Tubbs and Margaret Drake have illuminated the value of the use of crafts and other creative media in therapeutic settings. Inside this Fourth Edition, the authors give examples of the benefits of crafts, describe how to document their use, and give suggestions for effective implementation.A variety of craft categories, suitable for various treatment settings and appealing to a range of interests, are described and explained, as well as low- or no-cost projects and ideas for the therapist who may have limited resources.Each Craft Section Includes:* A case study demonstrating the craft in treatment and/or assessment* One or more sample projects, with grading and documentation suggestions for each* Supplies, time, and general preparation steps required* Precautions and safety considerations* Related discussion questions* Key terms, tools and suppliesCraft projects have been updated to be consistent with evolving cultural tastes and provide a wealth of ideas for adaptation to create the "just right challenge." Crafts and Creative Media in Therapy, Fourth Edition also contains information on how creative activities are suitable for use within various occupational therapy frames of reference, populations for whom the activities might be appropriate, adaptations and ways of grading the activities, and methods for documentation.Crafts and Creative Media in Therapy, Fourth Edition maintains focus on the therapeutic application of the media and emphasizes the most recent research and anecdotal evidence of crafts and their benefits.Instructors in educational settings can visit www.efacultylounge.com for additional material to be used for teaching in the classroom.Practicing occupational therapists and occupational therapy assistants, faculty, arts and recreational therapists, and activity directors will benefit from Crafts and Creative Media in Therapy, Fourth Edition.